Decorating the house for Christmas is an exciting and fun time of the year. People usually decorate the living room, the kitchen, the porch outside but they tend to ignore the entryway decoration. So this year, try to create something stylish and welcoming to catch everyone’s eyes. 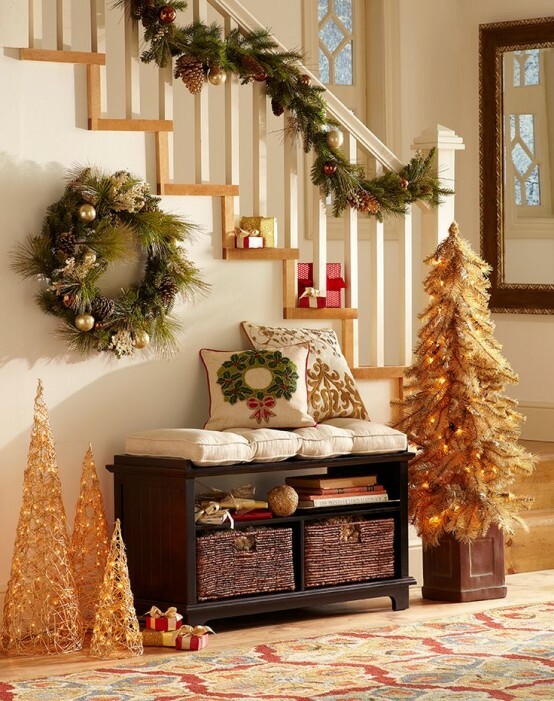 These classic pastoral Christmas entryway decorations look understated and yet very chic. What a better way to greet your guests with the timeless red-green holiday palette combined with some wooden and industrial elements. The rustically charming wall art is the cherry on top. If you are looking for some entryway table Christmas decorations ideas that would create a sense of effortless holiday glee, display some potted Christmas trees in various sizes. They will add texture to the foyer and will play splendidly with the warm white and wooden palette. 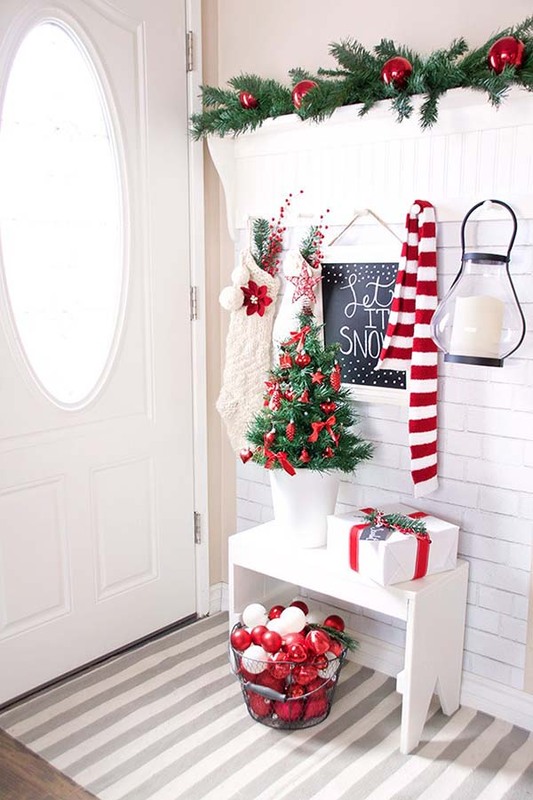 These entryway Christmas decorations are very cozy and welcoming. To start, the simple long garlands look very organic, casual and pretty without being too much. Moreover, I like how the classic holiday colors arranged with some vintage elements bring warmth and rustical charm to this foyer. 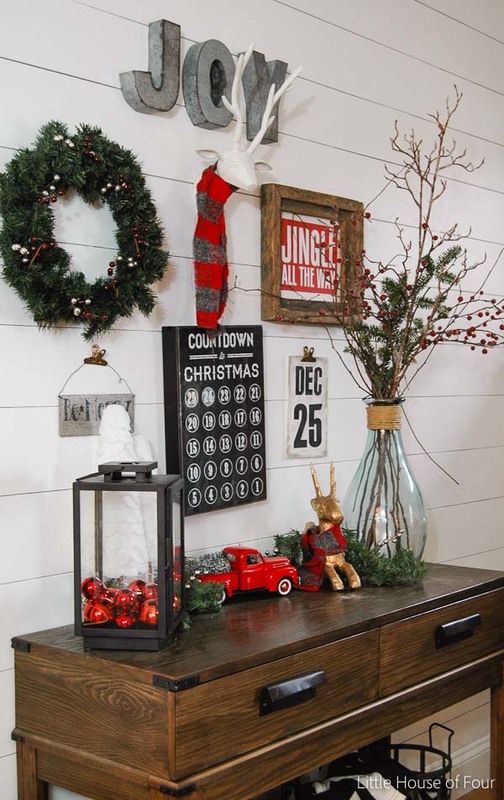 These primitive wooden wall signs are one of the best Christmas decorations for entryway (and not only) because they are inexpensive to make and can be customized very easily in accordance with everyone’s taste. I like the idea of having a big rustic sign on the eyes level and two smaller ones symmetrically displayed. If you want to create some cheap and stylish entryway decor which doesn’t consume too much time to make, think of buying a chalkboard and writing some greeting on it. 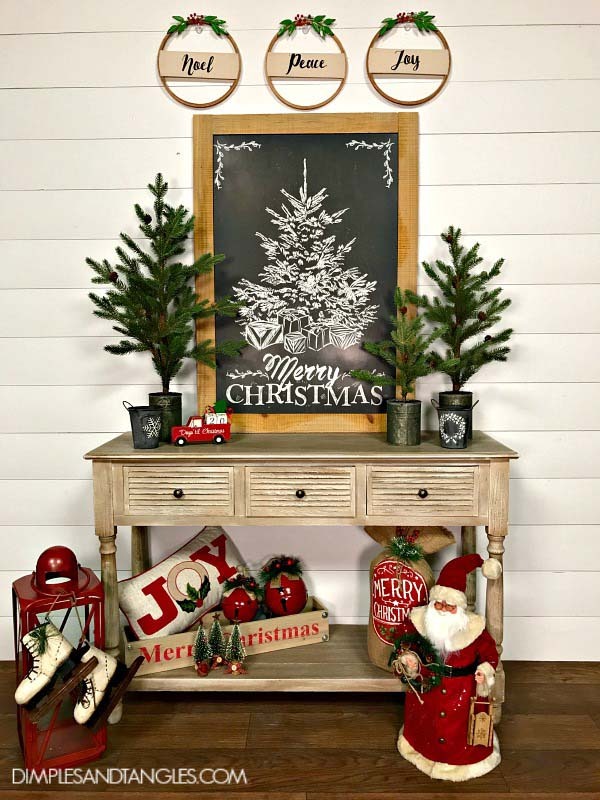 This rustic theme decoration would work for both the front and back farmhouse porches. 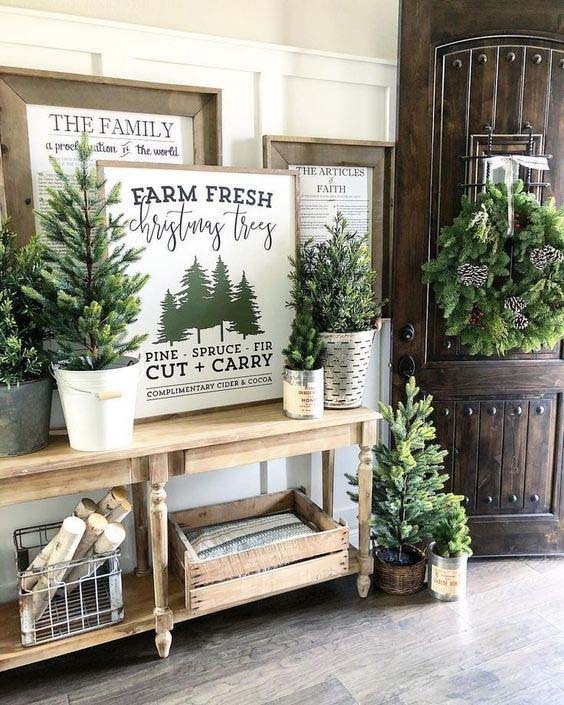 For the fans of the minimalistic farmhouse entryway decorations for Christmas, I’m sure you will fall in love with this project! The decor is very classic and cheerful with all the figures and the chalkboard that turns into the focal point of the entryway. Also, I adore the little red truck on the cupboard with the blocks that fit in it to count how many days there are until Christmas. For a naturally joyful entryway, hang a simple all-green garland over a cute sitting area arranged with a bunch of stylish cushions. Coordinating understated adornments and the large rustically charming wall sign “JOY” complete the farmhouse theme. 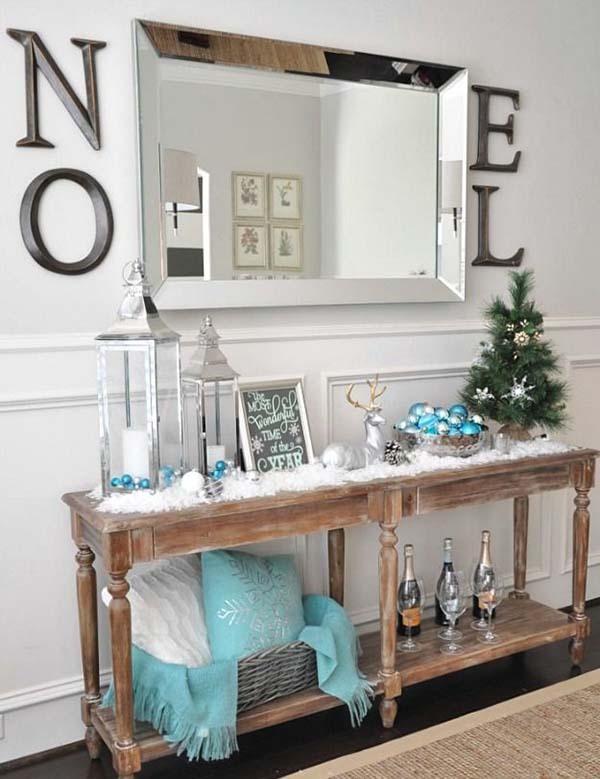 For sure, this is one of my most preferred Christmas entryway decorations! 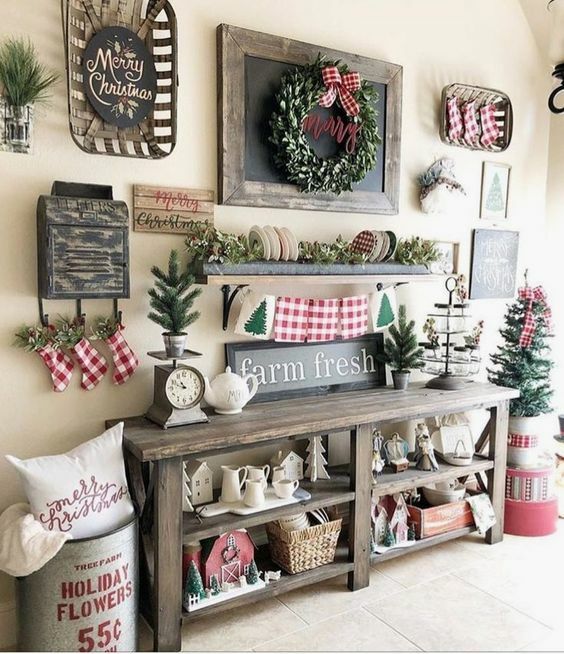 If you want to make all the guests envious about your entryway decorations for Christmas, consider creating a farmhouse gallery wall. Each piece makes a great contrast with the all-white wall. 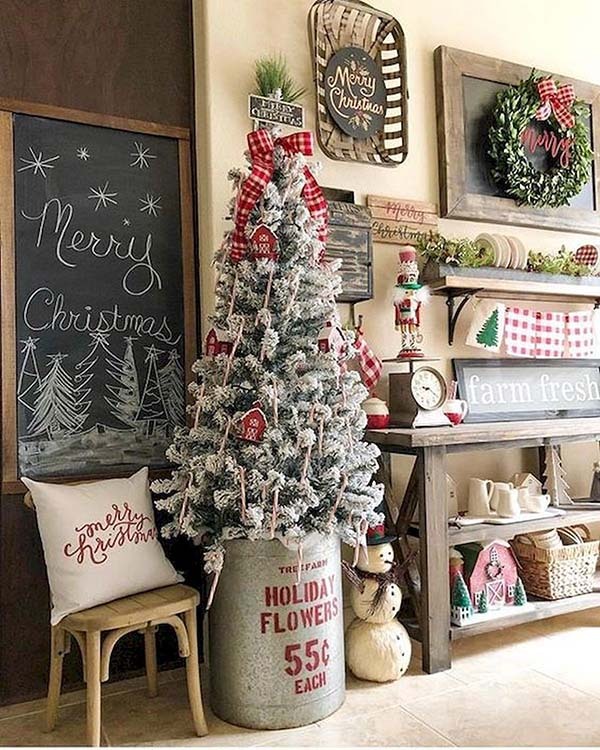 The red-green palette in the DIY sign “Christmas tree farm fresh” tie in wonderfully with the rest of the gallery wall decor. 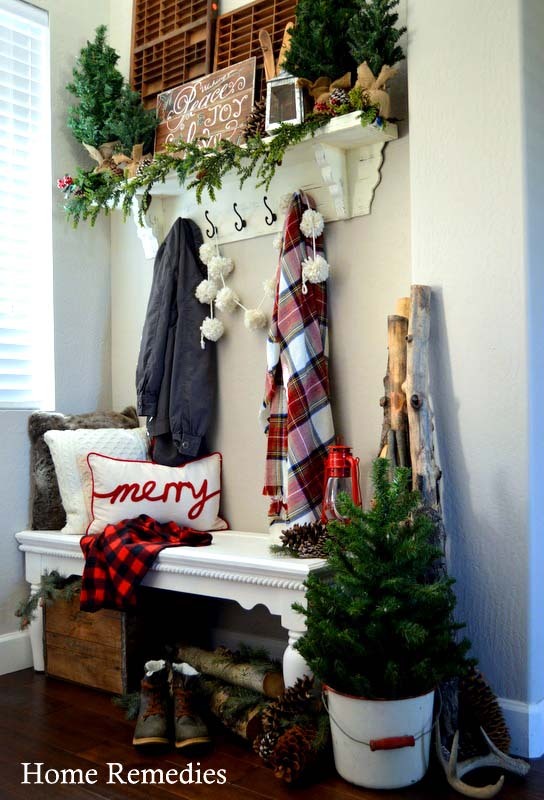 However, if you want to create some Christmas decorations in entryway which you basically don’t have, get some inspiration from the lovely project above. You can add a small and narrow shelf and bench in white (because the bright colors make space looks bigger!) and decorate with some smaller size classic elements. Great result! 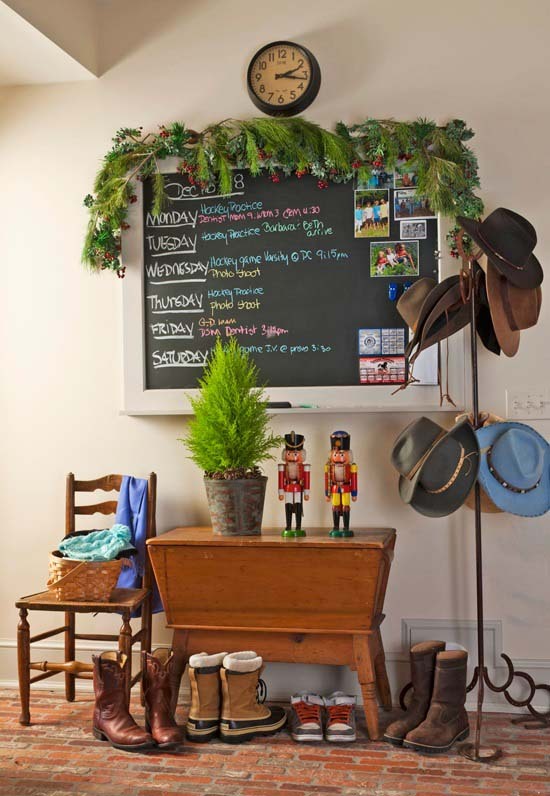 This high-ceilinged foyer is decorated very casually and unpretentious with a pair of classic nutcracker figures on a vintage wooden cupboard and simple evergreen details, like branches and cranberries draped over the family’s chalkboard schedule. No need of too much shiny decoration to create a holiday vibe at home, remember? I love the contrast between the natural-looking green garland and wreath, and the golden entryway Christmas decorations. It surely adds sparkle and whimsies to this rustically chic entryway. What a better way to greet your Christmas party’s guests than a classic green-red tabletop holiday decoration in the foyer! 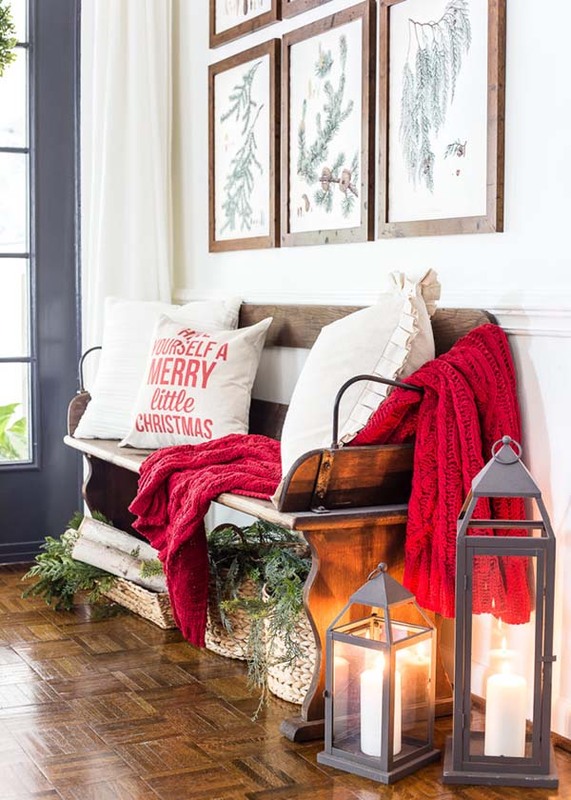 The large gifts wrapped in the red color palette give the entryway space some additional texture and cheer. 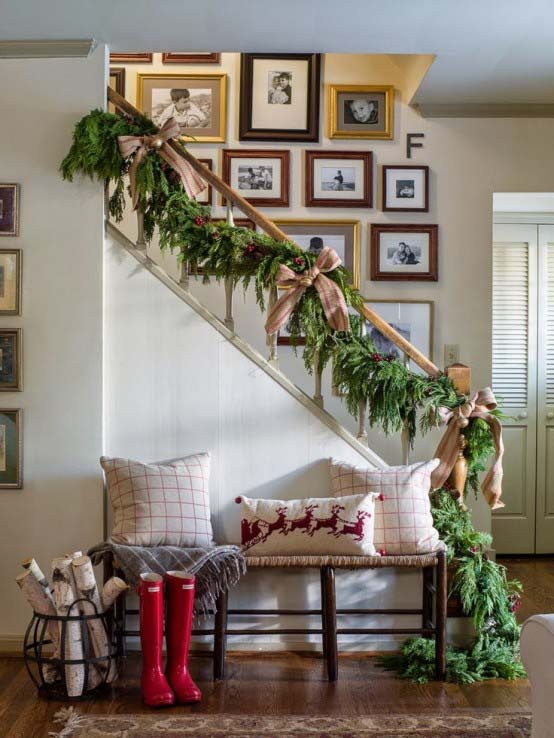 One of the most stylish entryway Christmas decorations of all times is the weaved garland around the handrail for a pinch of strong holiday charm. The pair of red rain boots keeps the timeless Christmas red-green combo alive. Love the enormous ribbons in pale colors as well! This Christmas, bring a personal touch to greeting guests by customizing the size, shape, material, and color of the wall sign for your foyer. The shimmering ball ornaments and the tiny faux festive tree add whimsical accents to this holiday welcome. 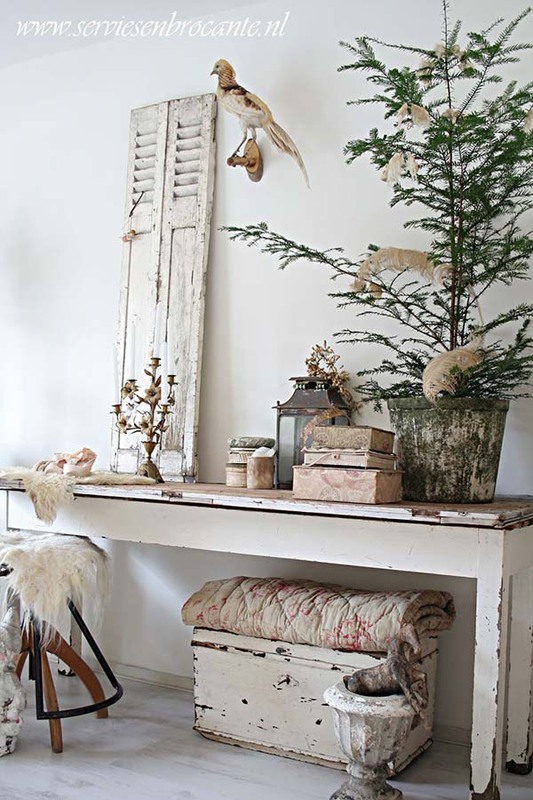 Here is one of the most artistic vintage Christmas decorations entryway I’ve seen so far! A real potted Christmas tree is strung with feathery instead of lights and shimmering ornaments. The reclaimed wood and the vintage elements, such as lanterns and candleholder, give the foyer space more warmth and originality. 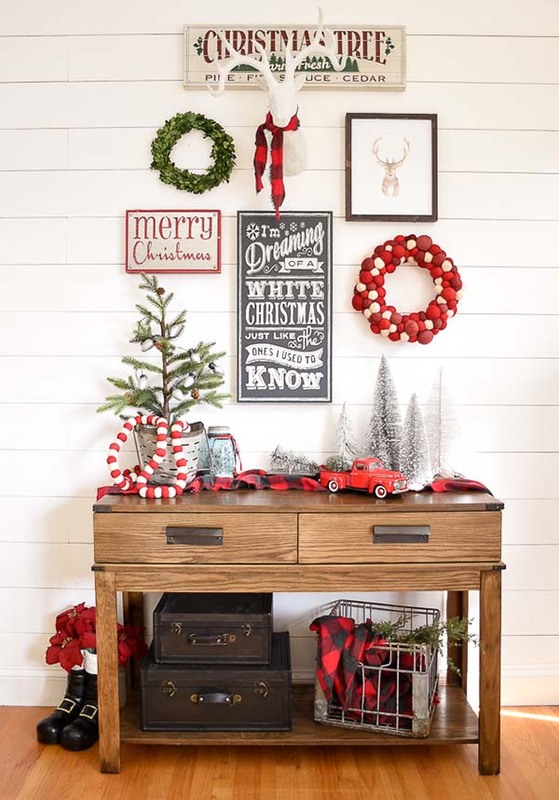 This old reclaimed wood sled decorated with some classic holiday ornaments will turn into the centerpiece of this year’s holiday foyer. The whole setting looks very cozy, joyful and unpretentious, isn’t it? 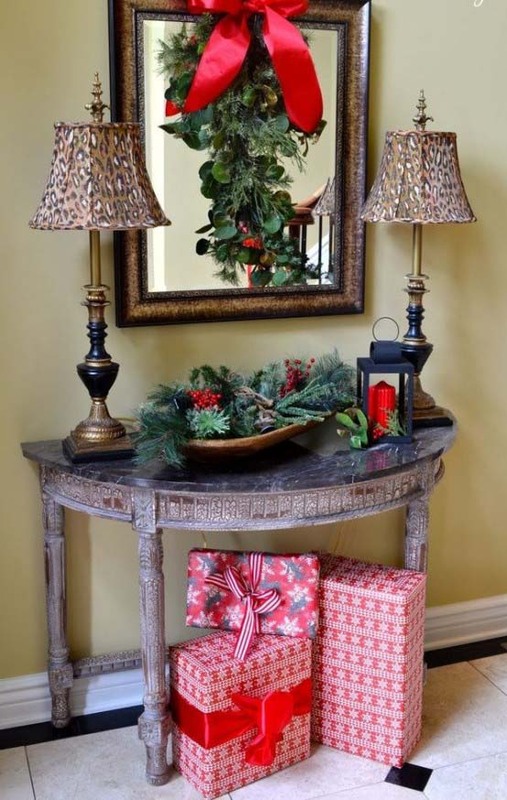 This dark wood foyer table is embellished with Christmas glee. The JINGLE sign in the reclaimed wood frame is printable. The festive wreath combines well with the rustic elements, while the lantern is filled with a bunch of small red ball tree ornaments for an extra glamour. This year, when you’re creating the entryway decorations for Christmas, avoid making it too literal. For instance, this symmetrical winter themed botanical gallery is a great way to greet friends and family without being a decoration that screams “CHRISTMAS”. Stick to the red-and-green traditions in the Christmas entryway decorations. 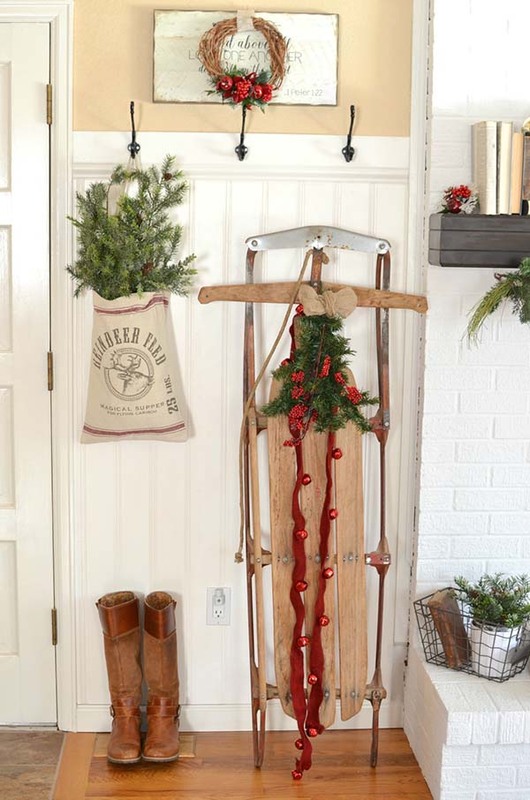 Hang old wooden skis in an X, then create a cozy display with a festive garland and potted trees with no shimmering ornaments. 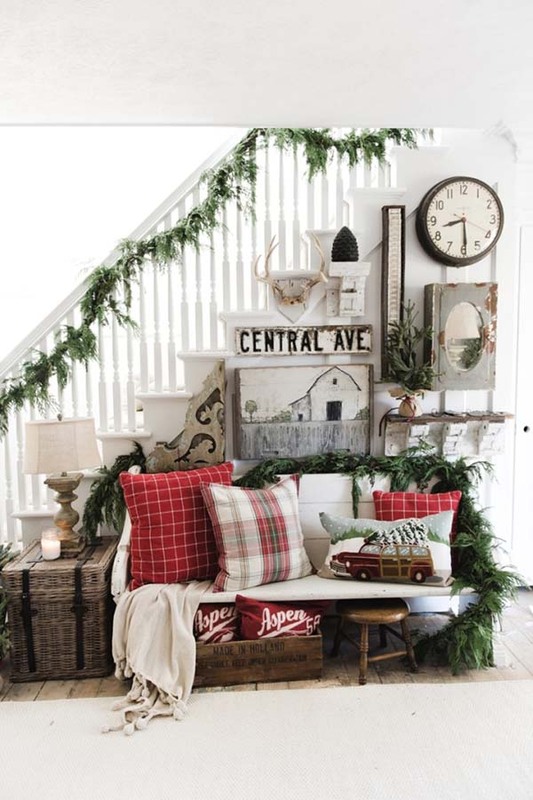 Give this space some additional warmth by heaping some festive pillows in the same palette. 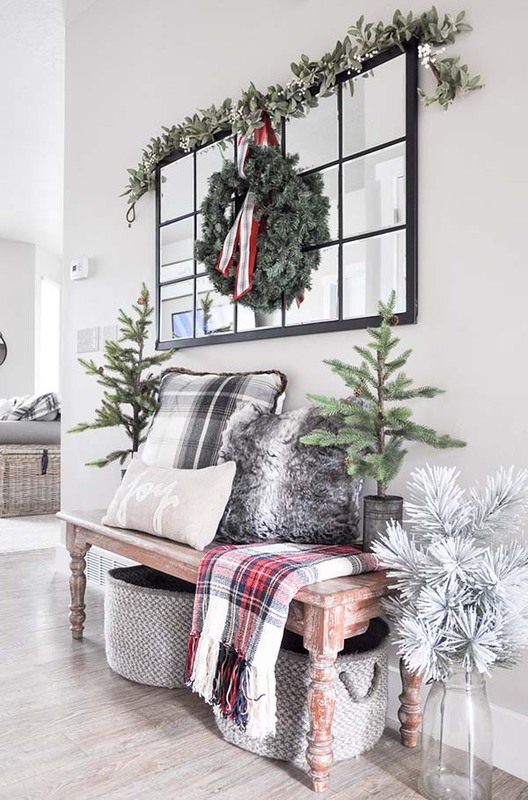 I know that some of you might want to create some sophisticated and glamorous entryway Christmas decorations, however, my advice is not to ignore the cozy, casual, and comfortable decor ideas! 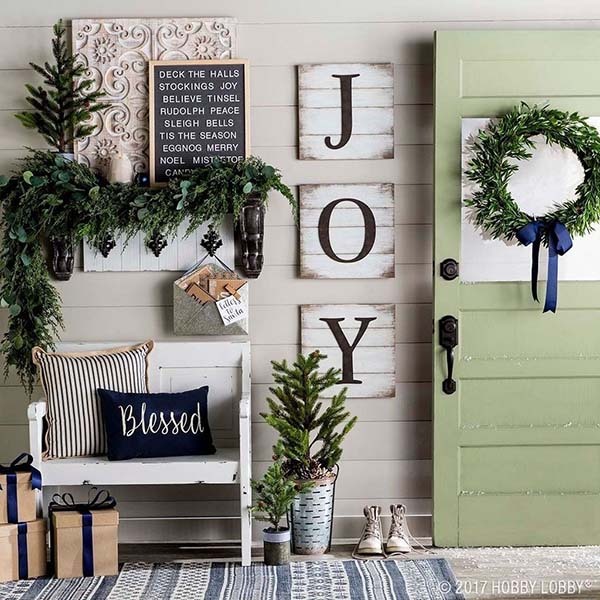 This beautiful reclaimed wood bench arranged with pillows and tiny potted festive trees, along with the artificial frosted evergreens and the enormous wreath above, is surely the focal point of this welcoming holiday entryway. While some rooms at home need specific Christmas essentials like tree and stockings, other areas, like the entryway, call for a little more artistry. The farmhouse themed decoration can be a great start! 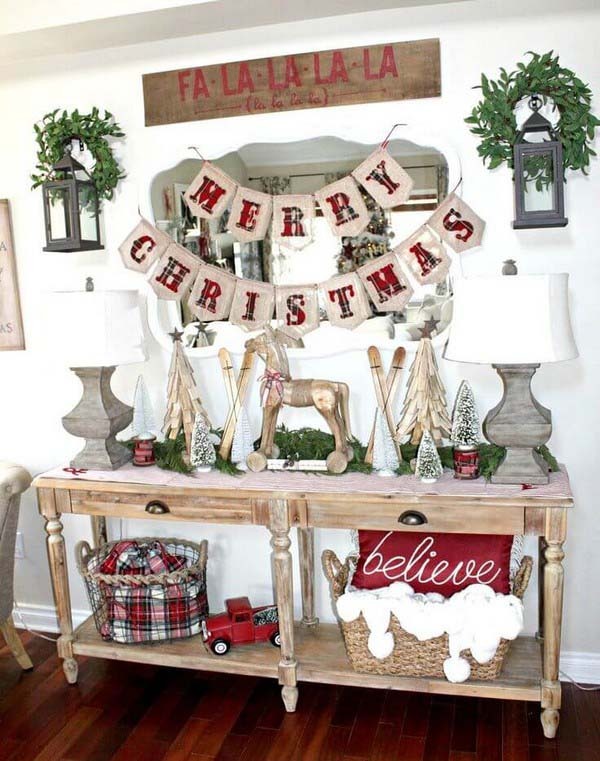 I hope these 20 rustic entryway Christmas decorations helped you get some spur.